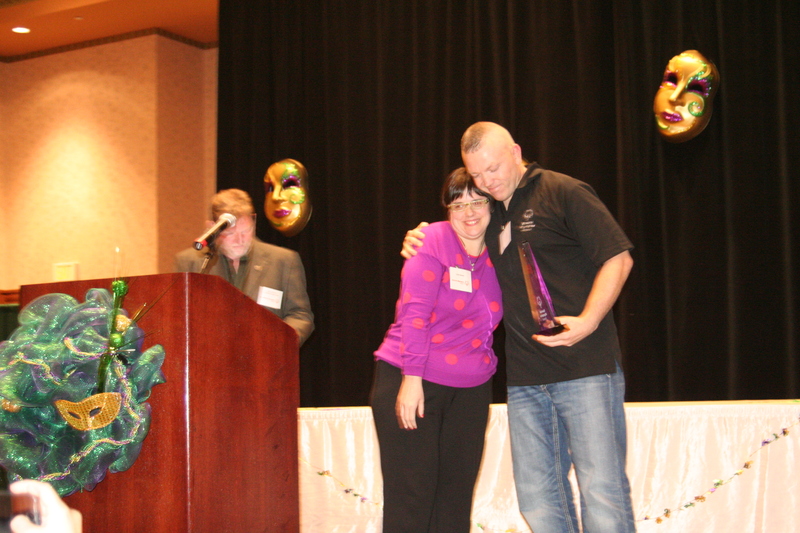 Jennifer Neihouse, Jeff Fugett, Mike and Kathy Lowry and the Hewlett family were all recognized for their outstanding contributions to Special Olympics Missouri at the 2014 SOMO Annual Awards Luncheon Jan. 18 in Branson. Each year, Special Olympics Missouri salutes those who have made significant contributions to the Special Olympics movement. Jennifer Neihouse has everything a coach could want in an athlete–hustle, hard work, always smiling, cheering, great team work, willingness to try new sports and then some! She participates in bowling, track, swimming, basketball, bocce, softball and powerlifting. She would do more if we offered it and it fit her schedule! Jennifer is currently tackling a swimming routine to improve her times so she can do well at this summer’s USA Games in New Jersey. Once again, we have challenged Jennifer to work hard at a sport that is not easy nor her best one but once again she is doing the work and making improvements so she can do her very best. Jennifer also exhibits a love for promoting the program and has taken the steps to be a Global Messenger. She has given her time to go out and promote the message of Special Olympics to many groups in KC. Jeff Fugett is a trooper with the Missouri Highway Patrol and has been involved with SOMO since 2000. In his time with SOMO he has served on various committees and participated in the Torch Run every year. Jeff also has volunteered his time at various events as well as hosting an area basketball tournament and has served for several years on the water crew at Summer Games. At the 2013 State Summer Games, Jeff decided to come up early and help coordinate a group of officers to set up the games. He then participated in the final leg of the Torch Run to open the games. When medal presenters didn’t show, he stepped in and helped present medals to the athletes. On top of what he did at Summer Games last year, he then did the same thing at Fall Games, helping with the tear down of each venue. In addition to his volunteering at events, he is also a Super Plunger raising a minimum of $2,500. He has been a Super Plunger for many years and truly does NOT enjoy jumping in the icy cold waters at the Lake of the Ozarks 24 times in 24 hours, but does so because he believe in the mission and in the nearly 17,000 athletes in Missouri. Kathy and Mike Lowry are both dedicated, passionate and selfless coaches who give their all to Special Olympics Missouri. The two-for-one package is hard to break. Mike and Kathy are coaches who work on improving their athlete’s lives by growing them as leaders both on and off the playing field. They are always looking for better ways to improve their athletes’ skills. They often give their time on a free weekend to travel to sports clinics and other activities, so the athletes can learn new skills and improve others. Mike and Kathy offer seven different sports at William Chrisman High School, but when athletes want to play a sport they do not offer, the Lowrys find a team for athletes to play on, and make sure they get to practice. 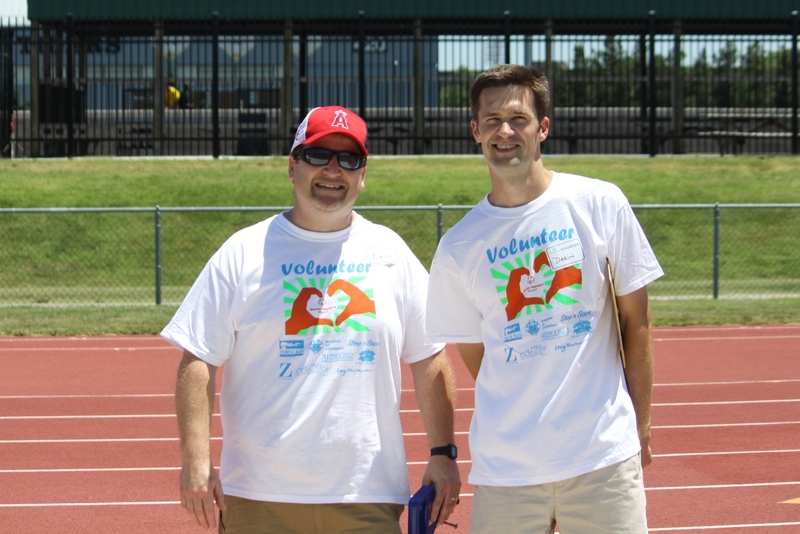 Besides these duties, they both volunteer their time as key Volunteer Managers at the area & state level competition. Both Mike and Kathy also bring their talents to Sports Camp for a week, in order to help make camp a wonderful experience fort the athletes. It’s nice to count on them as they can be moved around at events to assist with different activities and they will make it fun for everyone. 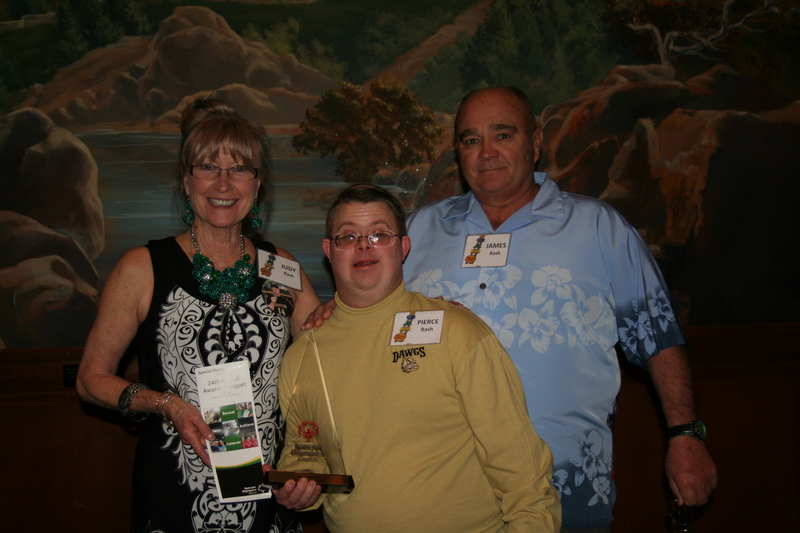 The Hewlett family is a family that goes above and beyond to build awareness for Special Olympics Missouri. Kim Hewlett is the mother of D.J., Emily and Sarah. Emily and Sarah are both athletes in the program. D.J. is their older brother and he volunteers in a variety of ways as a chaperone, Unified Partner and venue coordinator. Kim is a single mom who works a very demanding full-time job. She is an advocate not just for her own children, but for others as well. D.J. works full time at the sheltered workshop and goes to college in the evenings. D.J. applied for the job at the workshop because of his sisters and his involvement with Special Olympics and his love for working with individuals with special needs. 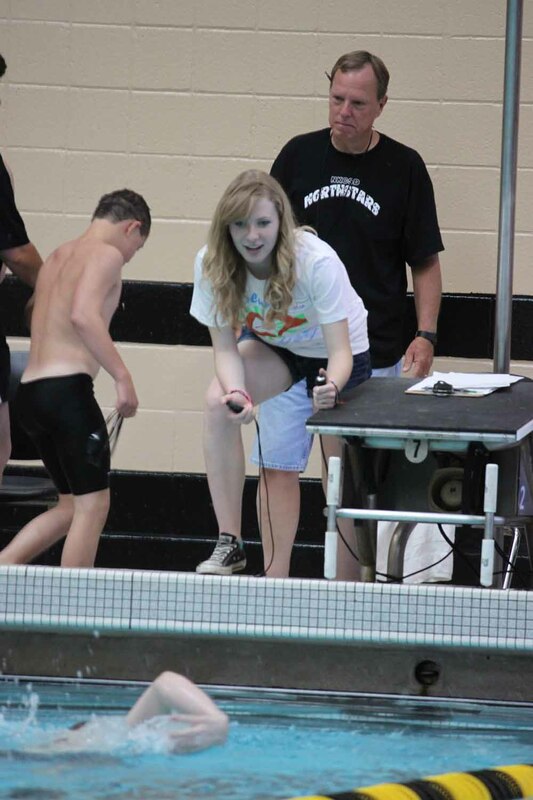 After reading the blog on VUHQ and saw that Special Olympics was looking for volunteers, I thought – what the heck I will see if they need anyone for the swimming events. I signed up to work the morning shift on Saturday and again the afternoon shift on Saturday since they were short on volunteers for the second shift. I had no idea that Veterans United Foundation was a sponsor of this event until I was looking at a fellow volunteer’s T-shirt. Watching these special athletes compete in a sport they love even with the handicaps that they had (some severe some not so severe) it was heartwarming to see the sportsmanship among the athletes, the sheer joy of when they touched the end of the pool after their race, asking for their time and the excitement when we shared their times and told them what a great job and hearing their coaches cheer them on, every athlete was yelled and clapped on during their races no matter how fast or slow they were. After 10 hours at the pool on Saturday, many wet hugs, high fives, thumbs up, getting splashed on (on purpose and the sound of their sheer joy of getting me wet) made my heart full and I count myself lucky to have participated in this special sporting event. I am very proud that I am a small part of VUF and that our Foundation supports such a wonderful event and we are truly enhancing the lives of these special athletes. Thank you for all you do! I’m writing to express my gratitude to SOMO, and the very special athletes, as well as the opportunity to volunteer my time. Although I have only recently volunteered a few times – once at a basketball tournament in Wentzville and once at the Area Spring Games Track and Field event – it’s clear that I will continue my volunteer efforts to support these athletes and this fine organization. I will try to express and share my brief experiences, but the old adage of “a picture is worth a thousand words” certainly applies here. I also recognize and understand that there are many other volunteers that are more qualified and experienced than me to share an opinion; however if you are giving consideration to becoming a volunteer for SOMO, please read through my thoughts and then “just do it.” You will have no regrets or you may think like I have and wonder why I haven’t done this sooner. My first experience, as mentioned, was in Wentzville where I worked keeping score for several basketball games. The players were adults who truly played the game for how it was intended. Observing the commitment of the coaches who reinforced the importance of teamwork, following the rules of the game, and fairness to players was clearly evident. The athletes themselves played the game at a high level with a sincerity and passion that you must observe in person. The genuine satisfaction and enjoyment in making a good pass and/or shot, and care for their teammates and the other team was always evident. The sportsmanship displayed during and after the game to everyone, including us scorekeepers, referees, and each other would warm anyones heart. The athletes simply appreciated the opportunity to compete. All levels of competitive sports could take lessons and learn from these athletes. I had only signed up for the morning session, but I assure you I didn’t want to leave. Actually, I then visited the school across the parking lot which was also hosting games, to see if additional help was needed. Fortunately, I was able to spend more time providing assistance for those games, as well. My second experience was at the Area Spring Games for Track and Field. I volunteered to be a “buddy” where I was assigned an athlete with the responsibility of being with them throughout the day to ensure that they attended each of their events. I was amazed at the number of volunteers, at least several hundred, anxiously ready to take on their assignment. The coordination and organization of the activities was admirable. I was fortunate enough to be assigned to Katie Heald, a 9-year little girl, who had the energy and enthusiasm of several athletes. She truly brought a smile to everyone at every event she participated. I also had the opportunity to meet Katie’s mom and her 12 year-old sister Jennifer, who also was a participating athlete, in the morning, as well as enjoy lunch together. After lunch, we took a few photos, and then continued on with the events. The excitement of receiving medals by the athletes and their families is also a “must see”. Katie’s events were completed early in the day, so once again I found myself not wanting to leave. I just observed people for about another hour in amazement and was humbled and honored to be a part of the day. I have had many great experiences in the field of education, where I have recently retired; however the gratification from the connection to these athletes and families, as well as other volunteers is second to none. Observing the coaches, proud families, athletes, coordinators, and other volunteers will want you coming back for more. I hope this encourages more people to set aside time to support the fine organization of SOMO, especially these fine athletes. We have volunteer opportunities throughout the year. Learn more on our website. GO WILD at the State Summer Games! Everyone who knows Special Olympics knows that the athletes are the heart and soul of our program. But, with more than 200 sporting events across the state each year, there are more than 30,000 individuals who are vital to the success of our program: our volunteers. The State Summer Games are coming up May 30 – June 2 in Columbia. These Games will feature the culmination of six sports seasons: track and field, bowling, basketball, aquatics, powerlifting and volleyball. Our athletes have been training for months for this big moment, and we need your help to make it a reality. Volunteer with a group. Whether it’s a group of family members, friends, a civic organization or co-workers, Special Olympics events are great teambuilding activities. Email Ashley at dawson@somo.org for a list of opportunities. Volunteer for a full day as a venue coordinator. These are great for volunteers who want a deeper level of involvement and/or who have some sports knowledge. Check out those opportunities here. We need photographers! Everyone loves to see photos of themselves, right? If you have an interest in photography, this is a great way for you to spend your time. Email Brandon at schatsiek@somo.org for more information. Donate money, goods or services. We’ll gladly take cash donations, but we also need things like meals, giveaways, water and ice. If you’re interested in contributing in this manner, email Susan at stegeman@somo.org. In exchange for your help, you will walk away with an experience you’ll be talking about for weeks. However you choose to get involved, GO WILD and witness the courage, strength, and talent of thousands of Special Olympics athletes. Sign up today. Volunteers, fans and teams staying off campus can park in the CG1 lot or the RP10 lot and use our free shuttle bus service! Cars and vans for teams staying on campus may park in their residence hall lot. Please park on the west side of the lot at bowling. Special thanks to our statewide sponsors: Shop ‘n Save, Law Enforcement Torch Run, Knights of Columbus; and our premier event sponsors: Southwest Dairy Farmers, Columbia Convention & Visitors Bureau, Zimmer Radio Group, Columbia Missourian, KMIZ, Veterans United Foundation and Break Time. The SOMO Hall of Fame was created in 1997 by the Board of Directors as a way to recognize longevity and achievement of athletes and volunteers within the organization. A voting committee, appointed by the SOMO Chairperson of the Board, is responsible for reviewing all nominations and voting on no more than two inductees in each category. To be inducted, finalists must be named on 75% of the ballots. A permanent display, housed in the Missouri Sports Hall of Fame in Springfield, features photos of each year’s Special Olympics Missouri Hall of Fame inductees. 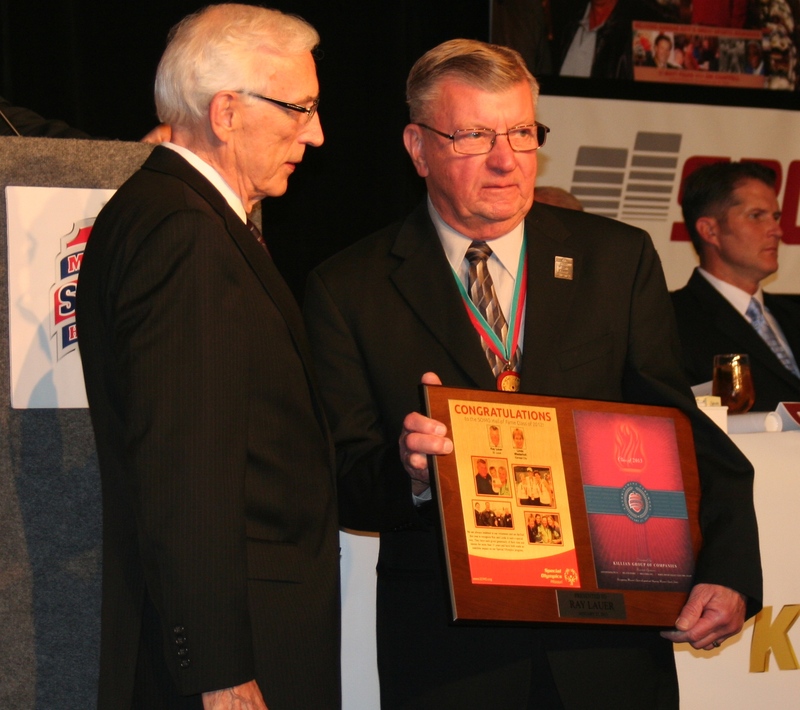 The 2012 inductees were announced Jan. 19 at our awards banquet in Branson, and they were enshrined in the Missouri Sports Hall of Fame on Jan. 27 in Springfield. You can read the prerequisites and download a nomination form on our website. As a Deputy Chief with the St. Louis Metropolitan Police Department, Ray became involved with the Law Enforcement Torch Run® for Special Olympics Missouri in the early 1990s. He eventually became the Chair of the LETR, a position which he held for seven years. During that time, the LETR doubled the funds it raised in Missouri and reached the $1,000,000 mark for the first time. Also during his tenure, Missouri was chosen as host for the International LETR Conference. Hosted in St. Louis, the conference launched Missouri’s LETR permanently onto the international stage, setting a high bar for future international conferences. After his retirement in October of 2003, he served on the Board of Directors until 2011. During that time, he served on the executive committee of the Board as secretary. He remains active in the LETR and on the St. Louis Over the Edge committee, as well as volunteering at the Polar Plunge. It is through Ray’s quiet demeanor and selfless attitude that he has had the greatest impact. An intangible impact is that through his example, all of his children followed in his footsteps in many ways. All three sons and one daughter became involved, either by volunteering at events or fundraising. His son Matt served as a staff member and his son Paul won the Wheels for Winners Raffle in 2011. 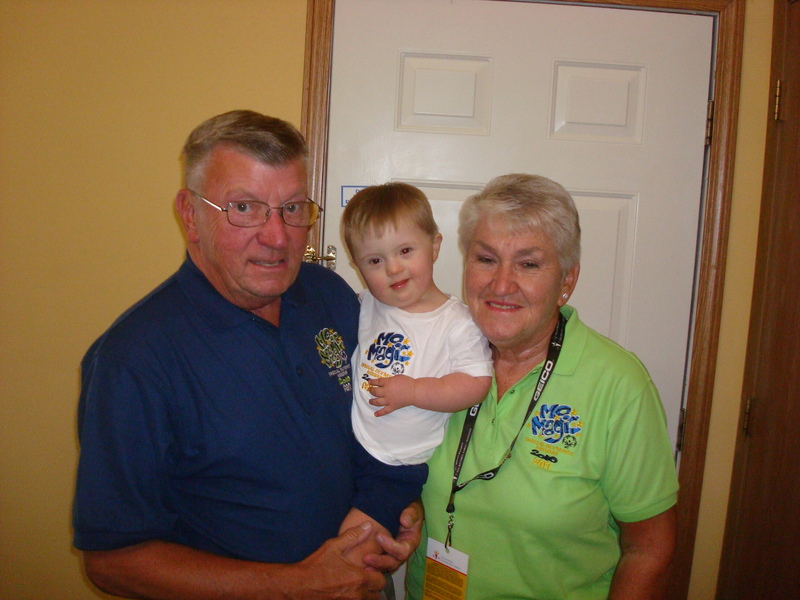 Ray’s involvement will continue as a fan of SOMO as his grandson, Andy, born in 2008 with Down syndrome, looks forward to one day being a Special Olympics athlete. Besides time with her family or with her job as a 6th grade math teacher, the vast majority of Linda’s time and energy is spent enhancing SOMO. She has been actively involved in both the Northwest Area and in the Kansas City Metro Area for decades. She participates in every facet of Special Olympics, including coaching, fundraising, mentoring, leadership, planning committees and recruiting athletes, volunteers, Unified Partners and youth. Linda is a member of the KC Metro Games Management Team. Even if she is actively coaching a sport, she takes part as the GMT and is always the first person there to help set up an the last to leave. She coaches and attends SOMO’s Sports Camp each year in Mexico, Mo. 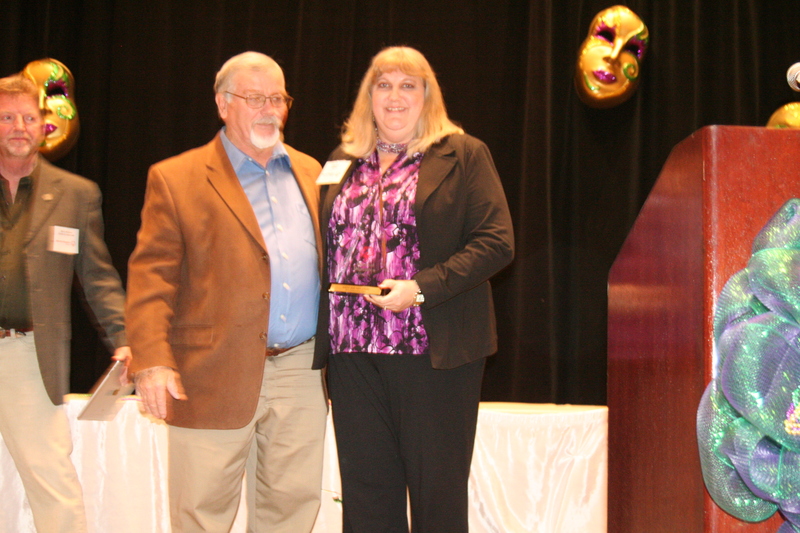 Linda attends and assists with all major Missouri events each year, including district, regional and state competitions and Leadership Conference. She attends and assists with KC Metro Area fundraising including the Dare to Dream Golf Scramble, Broadway Bridge Run, Polar Plunge and fundraising for her team. She is an active adviser on the Youth Activation Committee and Project UNIFY. 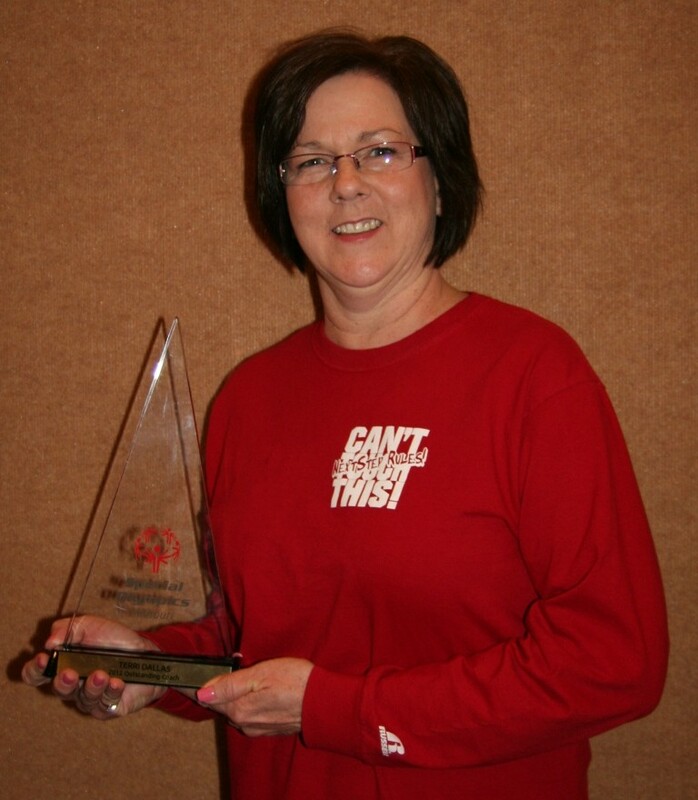 Linda prepared and trained athletes for the Special Olympics National Conference held in Kansas City in 2000 and was a Global Messenger trainer. Linda has expanded the Park Hill district from seven athletes to more than 100, and she continues to seek out and take on more athletes every sports season. She has greatly expanded the sports program, coordinating basketball, softball, track and field, tennis, bocce, bowling, golf and soccer. 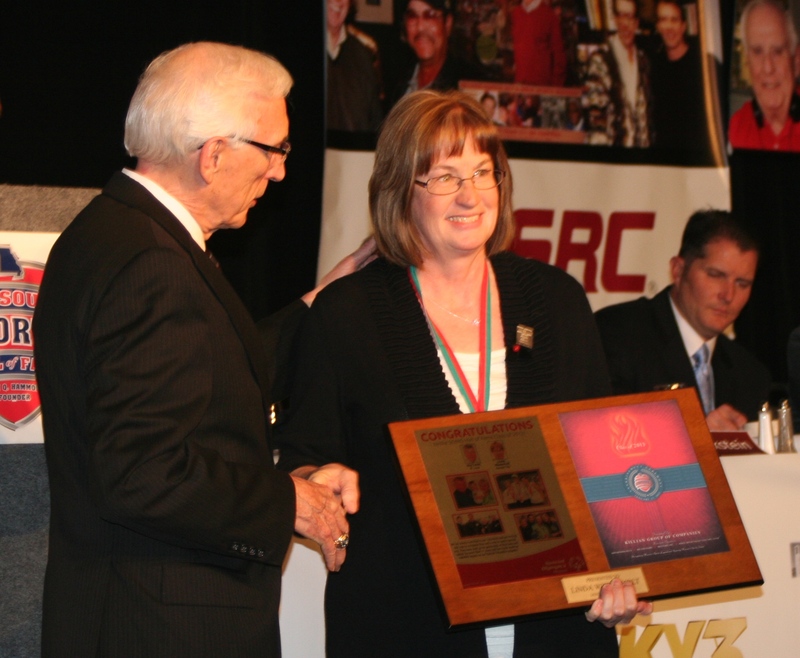 She has been recognized for her excellence within SOMO through winning the Outstanding Coach award in 2007. She was selected twice to coach Team Missouri for National Games. Her birth family, the Schiebers, won Outstanding Family in 2001, and in 2012 her “married life” family, the Wiederholts, were nominated for Outstanding Family in the KC Metro Area. Do you know someone deserving of this award? Download a nomination form for the athlete category or non-athlete category. 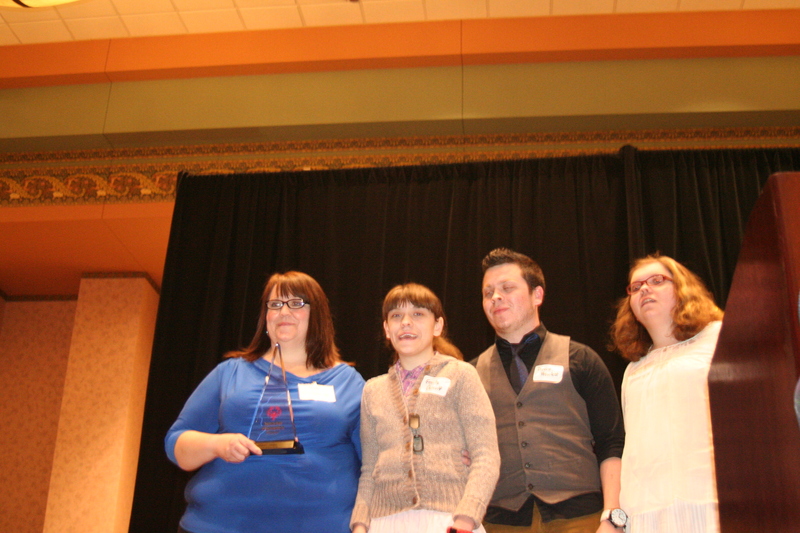 Matt Cepeda, Emily Reyes, Terri Dallas and the Rash family were all recognized for their outstanding contributions to Special Olympics Missouri at the 2013 Leadership Conference Jan 19-20 in Branson. Each year, Special Olympics Missouri salutes those who have made significant contributions to the Special Olympics movement throughout the past year. Each area nominee is submitted for statewide recognition, and the overall winners were announced at the Leadership Conference. At competitions Matt can always been seen trying his hardest and cheering for others. 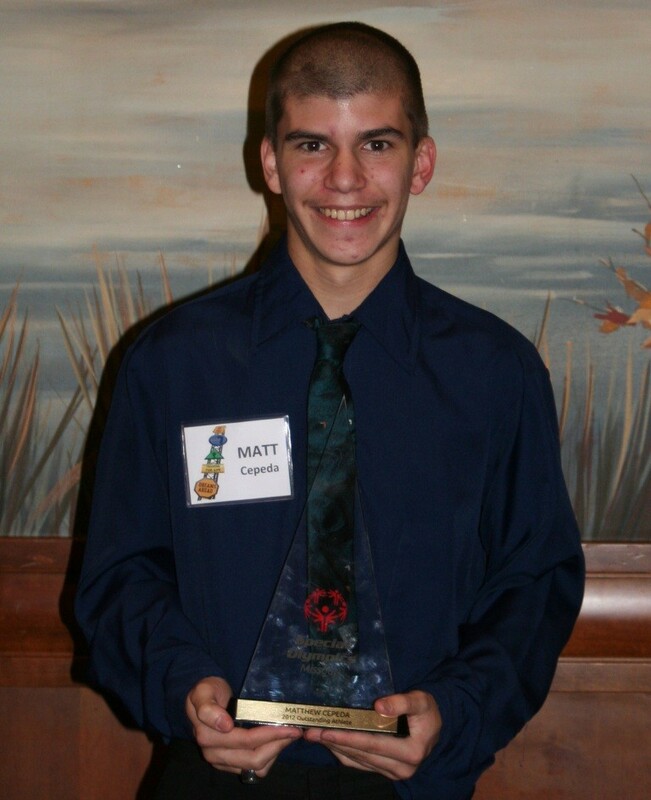 What is most impressive about Matt is his ability to be a leader in his school. He has become a huge voice around Missouri, but especially in Kansas City, for recruiting youth volunteers. He is the chairman for his school’s Fan Club and is the co-chair of Missouri’s Youth Activation Council. Beyond all this, Matt gives 100 percent to whatever sport he is playing, which says volumes since he plays eight sports! 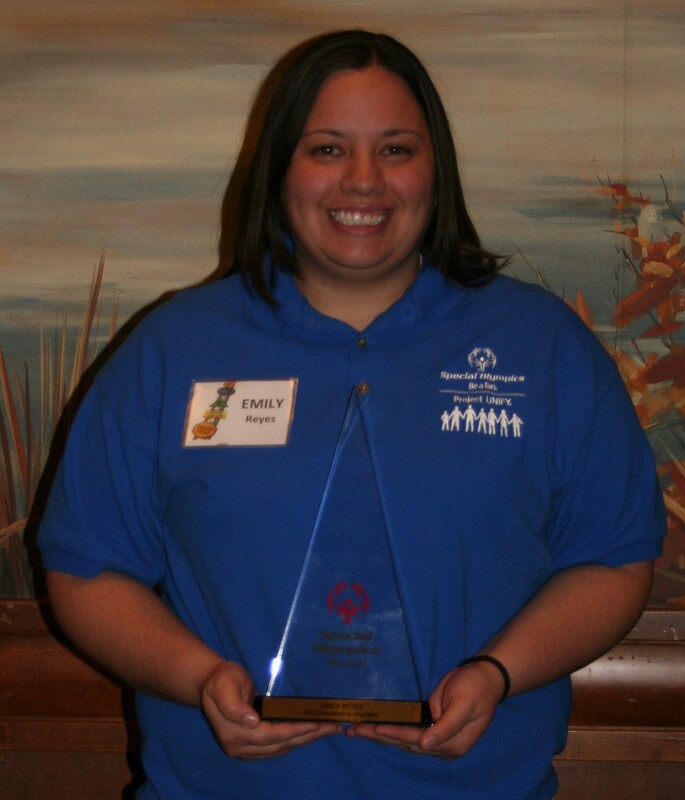 During her freshman year in high school in 2005, Emily volunteered to help with her school’s Special Olympics team. After that introduction, he became certified to coach bowling, basketball and track. Since that time, she has served as a counselor at Athlete Sports Camp and participated in many special events. 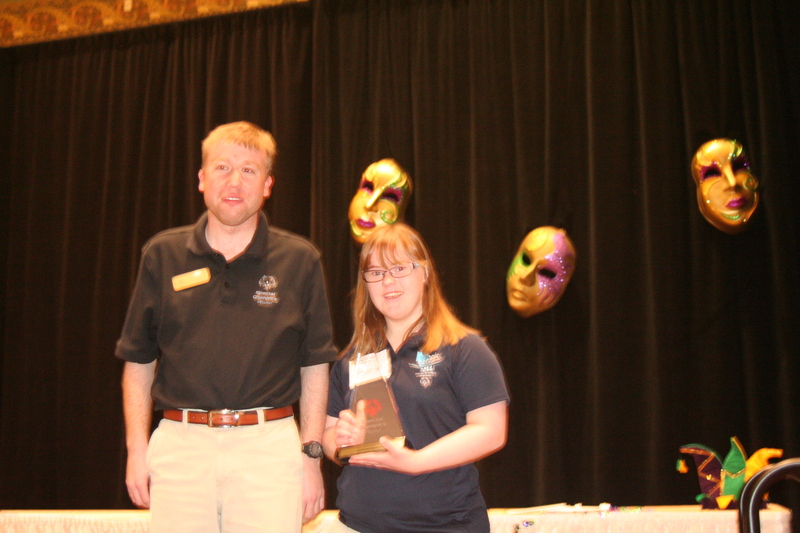 Emily recently finished her four year term on the National Youth Activation Council for Special Olympics, Inc. She’s traveled the country as part of this prestigious group. She continues to stay involved even while in college. For the past 25 years, Terri has coached SOMO athletes. She has brought countless athletes out of their shell and introduced them to a new way to make friends and build confidence through sports. She organizes and coaches six sports and hundreds of athletes in Jefferson County. 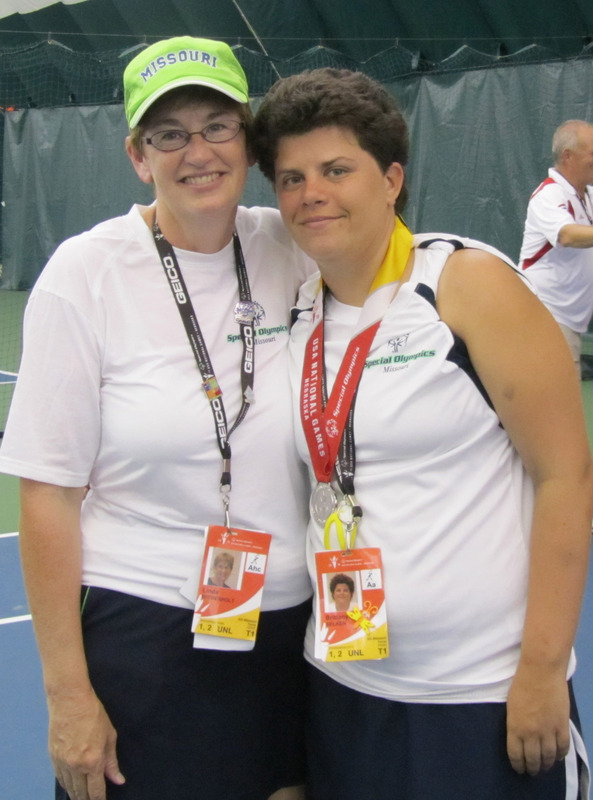 When one of Terri’s athletes qualified for the 2011 World Games in bocce, Terri was inspired to begin fundraising for a state-of-the-art bocce court for all the athletes through her program. The success of the Lake Viking Polar Plunge is due in large part to the Rash Family. Six years ago they stepped up to start the plunge at Lake Viking. Both Judy and James pour their heart and soul into the planning and fundraising for this event. James has become a coach for their son Pierce’s basketball and flag football teams. The whole family continues to seek new ways to improve our program and offer opportunities for everyone to participate. Congratulations to all of our winners! 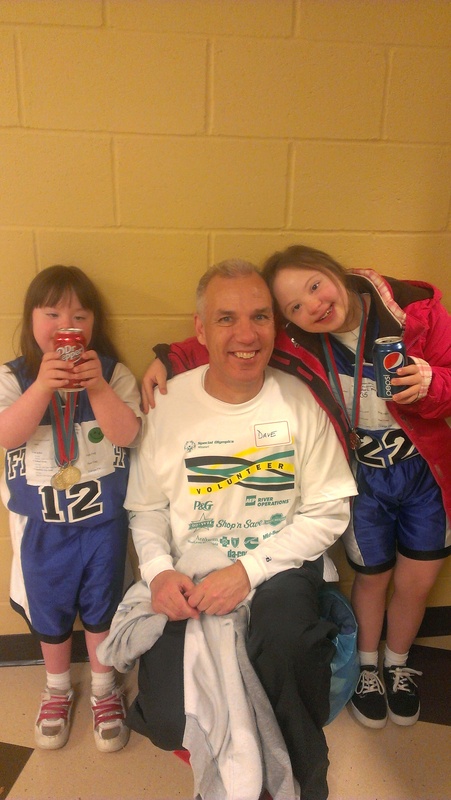 Their outstanding contributions helped make this a great year for Special Olympics Missouri.